Please join us October 14, 2017 for Amy’s Attic Annual Fall Craft Festival. This year we will be joining forces with Central TX Special Forces Assoc. 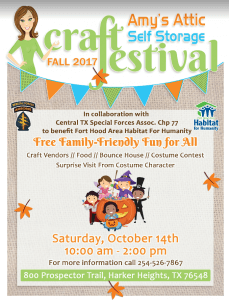 Chp 77 to benefit the Fort Hood Area Habitat for Humanity. • Includes vendors and original crafters from around the area. • Costume Contest for ages 0-15. Visit us on our Facebook page @amysatticfallfestival for more information.